Quality and commitment are paying off - especially for the training of the next generation at DATRON. For many years now, DATRON AG has been successfully filling new positions in the company, primarily with qualified and committed young professionals from within the organization’s ranks. Success is guaranteed, as the machine engineering company from Mühltal has trained more than 35 apprentices over the past 10 years alone that were taken on as permanent employees at the company. Currently, DATRON AG offers a solid individual and practice-oriented training in a total of six apprenticeship fields. Exemplary apprenticeships include the trades of industrial salespeople, mechatronics engineers, or recently introduced, trainings regarding dialogue marketing or media design. 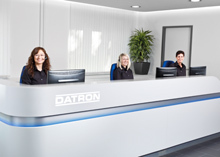 At DATRON, apprentices receive individual, practical and first-class trainings. During the 3-3.5 year apprenticeship, the young people become familiar with the entire business and are actively involved in the company's workflows from the beginning. The apprentices benefit from the flat hierarchies and a relaxed and open-minded atmosphere at DATRON, in which each trainee is always encouraged to ask questions, seek an exchange with experienced colleagues and individually promoted according to individual strengths and interests. DATRON AG received a particularly valuable confirmation of the outstanding quality of its vocational training on 20 September 2017 when the chamber of industry and commerce (IHK) chapter Rhein Main Neckar “Honored the Best” in Darmstadt’s science and convention center "darmstadtium". Of the approximately 3,000 apprentices who completed their apprenticeship in the chamber’s district in 2017, the top graduates from this year's finals were honored together with participating vocational schools and companies. 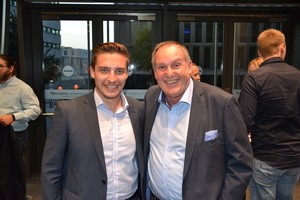 DATRON was among the honored: Among 122 fellow apprentices, DATRON’s Sebastian Bialas, who completed his apprenticeship as a technical product graduating top of his class, received the IHK “Honoring the Best” 2017 award together with the company’s technical training manager Franz Gruber. "We are very pleased with this award, because it is a great confirmation of our long-standing commitment and our successful work in the field of vocational training at DATRON," says Franz Gruber, who has been head of technical training at DATRON for over 35 years. In the future, the focussed training of specialists within the company will play a central role in the development and promotion of young talents. The central pillar for the company's long-term success is, first and foremost, the right team of dedicated and highly qualified DATRON staff, who collaborate to turn DATRON customers into champions with great, innovative machines and latest technological solutions for a continuously prosperous future of DATRON AG.